DUMBARTON gained a valuable point against promotion hopefuls Dundee United at Tannadice. 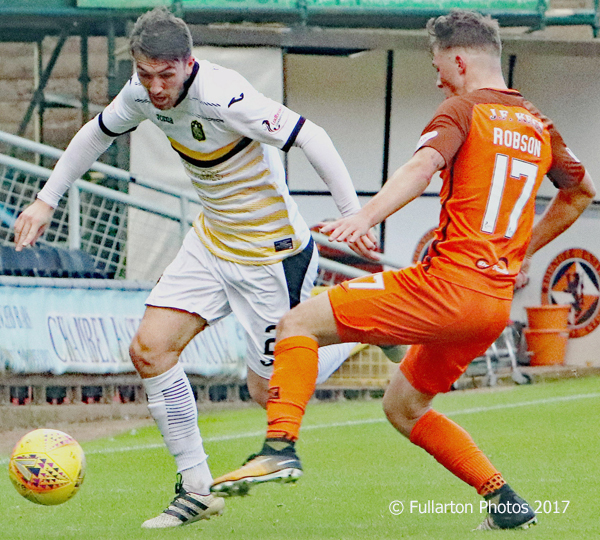 DUMBARTON gained a valuable point against promotion hopefuls Dundee United at Tannadice — and it was so close to a victory. A crowd of 5,331 saw a spirited performance from Sons, with David Smith giving them a fifth minute lead, sneaking in at the back post to convert a Tom Walsh cross. It was his first goal for the club. United forced a save from Scott Gallacher on the twenty minute mark before Walsh again tormented the home team's rearguard. Dumbarton surrendered possession a little too easily at times but were effective on the break and headed into the half-time break ahead. Gallacher made two outstanding stops to deny United on the hour mark with the Tannadice team pressing. Walsh almost doubled Dumbarton's lead in 75 minutes with a looping shot that evaded keeper Harry Lewis but bounced off the crossbar. Sons cruelly lost their goal advantage on 86 minutes when James Keatings fired home a blistering free kick from 19-yards after David Wilson had given away the foul. The visitors held on in the remaining minutes to claim a precious point. David Smith is pictured going past Jamie Robson.